To begin with, skeptics deny completely the existence of the spiritual world and also the communication that could exist between both planes, (the spiritual and the physical plane) and this denial is a sign of their incapacity to understand something they do not know anything about. For instance, mediumnship is a natural way by means of which an incarnated being can be contacted with disincarnated beings or spirits. And here the problem appears, because the medium is a translator of spiritual concepts, if the medium is not highly qualified, he or she will translate badly and the result will be disastrous. The reason for which mediumship has been badly seen by skeptics is because they think that the concepts come from the medium and not from a spiritual entity – this is the only reason they have to attack mediumship- and they dismiss it completely for that reason. Except for rare exceptions, in this time, there are very few mediums capable to translate the spiritual concepts accurately, less than 4 in the whole world. Most of the mediums channel the spiritual messages with only a 20% of accuracy. Obviously, if those mediums channel with 80% of error, their messages will not be reliable. However, in life there are always exceptions. Professor Jorge Raul Olguin, reached a translation capacity of 95 % accuracy (at present he reaches 98%) and everything changed completely. Mediumship requires of many factors so that it is successful, one of them is that the medium has to be clear (free of engrams) because engrams can provoke distortion of the messages, the medium also must be in a plane of Light 4 or 5 in order to receive reliable messages. Professor Jorge Raul Olguin is precisely clear and his thetan inhabits in the plane 5.9. In addition he also has deep esoteric knowledge. This last requirement is very important because if a medium ignores many things, he will not be capable to translate the concepts that are highly complex, and his channelings would be merely trivial messages. Skeptics have not investigated thoroughly mediumship because they have considered it a fraud from the beginning. Therefore, their attitude is biased since they are conditioned to “believe” that it’s a fraud based on a preconception. A genuine scientist, on the other hand, would try to investigate the evidence based on physical and mental experiments. Unfortunately, this has never happened and what has confused skeptics is that most of the mediums, or rather almost all of them, scarcely channel the spiritual concepts with only 20 % of accuracy. However, they keep saying that these channeled messages do not come from spiritual entities and they are only inventions of the medium. This affirmation was debunked when we perceived by means of experimentation that the answers the medium gave about topics he didn’t know anything about were completely coherent with regard to the channeled entity. This is the simple truth, skeptical investigators do not consider the evidence because they already have a preconceived idea of a fraud, and thereby, they reject any test that could demonstrate that they are wrong. They will never admit their mistake because they are too arrogant to reconsider their position. And this is the simple history of the skeptical investigators and the reason of their ludicrous conclusions. We are not against the authentic skepticism, the healthy skepticism, the objective skepticism. A true skeptic is a person who uses common sense and reasons rationally, a person who shows willingness to consider alternative explanations without prejudice and preconceptions and a person who seeks out evidence and carefully scrutinizes its validity. However, we are against the cheap skepticism, the ignorant skepticism, the sick skepticism that denies everything for no reason. These skeptics should call themselves pseudo-skeptics instead because they do not offer another valid solution to many mysteries; they do not come up with new valid ideas, they are only devoted to negative criticism, which is criticism for the criticism itself and they have not even read half of the pages we have published. They usually read one or two pages and if they disagree with the idea, they already think they have the authority to criticize all the other pages they have not even read . On the other hand, a honest skeptic, is the one that evaluates all the possibilities, without leaving any theory aside – even if it’s spiritual or extraterrestrial – a honest skeptic would offer another solution that could be reasonable according to his studies and knowledge and of course after studying very well all the aspects and all the proposals that were given based on physical and mathematical evidence. Any theory based on honest criticism would be then welcome. Regrettably, till this moment nobody has come up with logical or valid theories, nobody has given alternative explanations without prejudice, nonetheless, they keep criticizing based on prior beliefs and that criticism is not valid obviously. Some people ask us for proofs in order to believe that the channelings are real, for example they ask the medium to reveal the name of a wife, the school they went to, and things like that, believing that if we give the true answer, then, they will be capable to believe. The problem is that it’s very easy for the medium to answer this kind of questions because the Masters of Light know exactly what we are talking about and from their plane they have the means to find it out easily. However, this is also the kind of things that the spirits of error precisely do in order to deceive ingenuous people, those who have investigated thoroughly mediumship know that the channeled entities at first give real answers and later on, when they have convinced gullible people, they begin giving false information. The Spirits of Light do not manipulate people in order to be believed because they know that the one who is in time does not need proofs and therefore he or she does not ask for them. This doctrine, which is the base of Grupo Elron, says that it is not necessary to have the absolute certainty of all the information, but it’s enough that it removes the confusion, something that can be achieved even with a false fact. Through the Doctrine of the stable datum, recalcitrant skeptical people can accept "temporarily" something without studying the teachings of the Masters of Light we have published. And if in the future better explanations appear, the only thing they have to do is to leave aside these "provisional" teachings and accept the new information and move forward. Thus, they have not compromised their skepticism, and with their pride intact, they can keep on being recalcitrant skeptics safe and nobody is going to point at them with the finger accusing them that they had changed their point of view like a weathercock. Carl Sagan committed two terrible mistakes in his life that stained his brilliant scientific career: He denied openly the existence of the spiritual world and therefore that through mediumship this communication could be possible, he denied also the presence of extraterrestrials in our planet, denying obstinately the irrefutable proofs against his position. In addition, his well-know writing “The Burden of skepticism”, which the skeptics took as a banner in spite of its infantilism produced a great damage to the teachings of the Masters of Light. Carl Sagan did not consider the slightest possibility that he could be wrong, instead he criticized J. Z. Knight, who evidently was a bad channeler who distorted many channelings. Carl Sagan extrapolated her case and stated that all channelers were like her. He did not try to find other mediums and compare the data. This is very odd because any analytic scientist would try to gather all the evidence first and evaluate all the cases separately and finally give a conclusion; Carl Sagan just took her case and gave a conclusion without delving thoroughly into mediumship. Carl Sagan never understood that a medium decodes spiritual concepts and translates these concepts into spoken language, so it’s impossible to get a mathematical formula if the medium does not have the knowledge to express formulas. Moreover, only a bad medium would try to mimic the accent of a channeled entity like J.Z. Knight did speaking English with an Indian accent. Evidently, Carl Sagan didn’t consider these two possibilities. 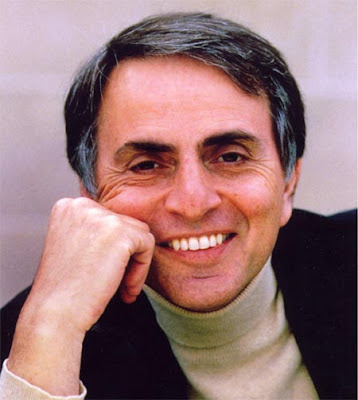 In his own words Carl Sagan said: “But I try not to think with my gut. Really, it’s okay to reserve judgment until the evidence is in.” However, he didn’t reserve his judgment in the first place; he did not get hard evidence to prove that mediumship could have been real. In the end, he used his gut to prejudge implying that mediumship was a fraud after all. Isn’t it contradictory? Interlocutor: Before to move on to another topic I’d like to ask if Carl Sagan's article “The Burden of Skepticism” has caused a lot of damage. I admit that his article drives me crazy and causes me irritation. Ruanel: …Besides, Carl Sagan himself said that the possibility of inhabited worlds was real. Ruanel: No, he was not interested so much in life so that somebody could threaten him. Besides, he was such a big important figure that if they had threatened him, he would have automatically denounced it and his accusation would have appeared in all the newspapers. This entry was posted at Sunday, March 28, 2010 and is filed under Concepts . You can follow any responses to this entry through the .